Optical Limits (formerly Photozone.de) reviewed Sony FE 70-200mm f/2.8 GM OSS G Master lens and it produced very respectable results, but for half the price you can get the Sony FE 70-200mm f/4 G OSS or Sony FE 70-300mm f/4.5-5.6 G OSS. I personally own the Sony FE 70-300mm f/4.5-5.6 G OSS and find it to be a great value performance lens. The Sony FE 70-200mm f/2.8 GM OSS is an impressive piece of equipment. The broader center-zone is especially outstanding when keeping in mind that the lens has been tested on a 42mp sensor. The far corners could be better at 70mm f/2.8 and 200mm f/2.8 but that’s usually not an issue in real life. Lateral CAs are low. Image distortions as well as vignetting are well auto-corrected. The native distortion characteristic is somewhat worse compared to what we’ve seen with similar DSLR lenses though. The quality of the bokeh is pretty nice for a lens in this class. The amount of bokeh fringing is about average. The build quality is perfectly aligned to professional standards. It feels super-sturdy and the weather sealing certainly helps when the going gets tough outdoors. Sony also paid attention to details such as a retractable window in the lens hood for using a polarizer and a bunch of focus stop buttons. The built-in image stabilizer is good enough for about 3 f-stops. If there’s one aspect that didn’t really convince us, it’s the auto-focus. Things may be different on the A9 but on the A7R II, the speed wasn’t all that great (compared to DSLR lenses) and we even experienced a few bugs which we haven’t seen in other Sony lenses so far. If you want to achieve shallow depth-of-field with a zoom lens, the Sony FE 70-200mm f/2.8 GM OSS is certainly a go-to lens in the Sony system – albeit a pricey one. 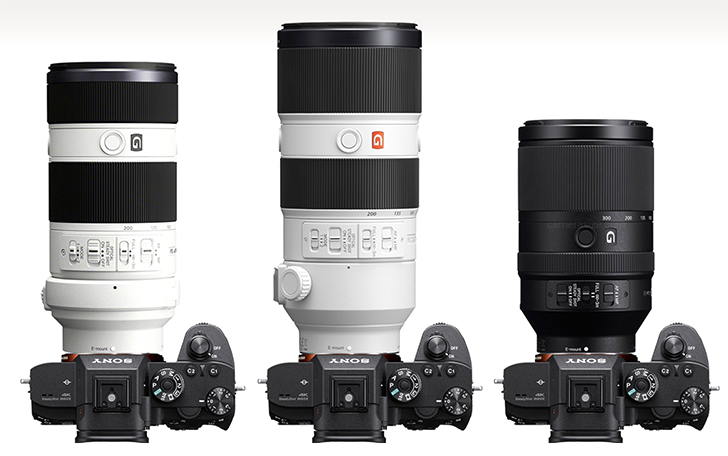 Sony’s 70-200 range of lenses offer a few options and you really cant go wrong with any of them. If you don’t absolutely need their f/2.8 than you’re probably better of with their f/4 lens or longer 70-300mm zoom. You can read the full review here. This entry was posted in Sony lenses and tagged Sony FE 70-200mm f/2.8, Sony FE 70-200mm f/2.8 GM OSS G Master lens, Sony FE 70-200mm f/4 G OSS, Sony FE 70-200mm F2.8 GM OSS, Sony FE 70-300mm f/4.5-5.6 G OSS. Bookmark the permalink. Trackbacks are closed, but you can post a comment.